"a rollercoaster ride that bounces between some of the most politically unstable regions of the world and back with heart-stopping speed." 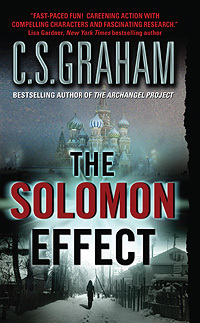 "I was utterly fascinated by The Solomon Effect. was fast paced, didn't drown in technical descriptions, and was a well-crafted, riveting story....Author C.S. Harris is the husband/wife team of Steve Harris and Candice Proctor. Combining Harris' expertise in national intelligence and Proctor's gift for historical research with their combined writing skills, this duo has created a fascinating series." "With nail-biting tension and hair-raising escapades, Graham takes readers on a thrilling journey of conspiracy and international espionage. Scary, yet believable, it's a gripping novel that will leave you questioning the repercussions of world events. A great follow-up to The Archangel Project." "a well written, absorbing and intelligent thriller...Don't miss this one." "Harris spent 21 years as an Army Intelligence officer and that experience clearly shines in this work. The plot and intrigue is believable enough to make this a page-turning thriller."